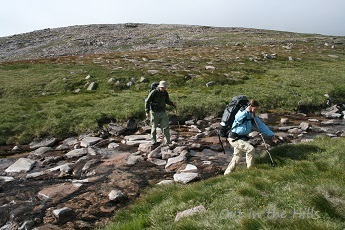 Out in the Hills provides a range of 2, 3, and 4 day (and longer) wilderness treks in the Highlands of Scotland. We carry all our equipment, but the walking is at a reasonably leisurely pace - we're there to enjoy ourselves, not for some sort of endurance test! Included in the cost: we provide all expedition equipment - tent, sleeping bag and liner, thermal insulating ground mat, cooker, fuel, and expedition food (evening meals and breakfasts) - although everyone carries their fair share. For more details click here to see the Gear Checklist. 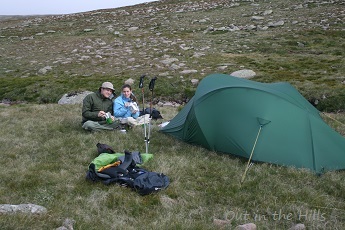 More opportunities to visit the remote wild camping spots of the Cairngorms. Leaving Aviemore after breakfast on day 1 and getting back there late afternoon on the final day. Each afternoon, once we've found a suitable location to camp and pitched our tents, there will be the opportunity to climb to the top of one of the nearby hills such as The Devil's Point, Ben Macdui, Derry Cairngorm, or Beinn Mheadhoin. 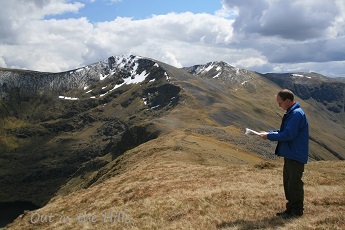 2 day trek: 1 person £250, each additional person £150. 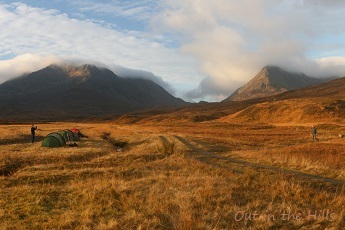 3 day trek: 1 person £350, each additional person £200. 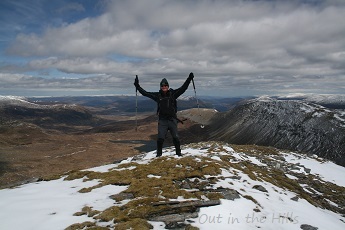 4 day trek: 1 person £450, each additional person £250. Transport from the Aviemore area is included. If you fancy the idea of wild camping somewhere remote, but don't want to commit to 2 or more full days, why not try one of our taster sessions: we set off from Aviemore in late afternoon, walk for just a couple of hours, then pitch the tents. Next morning there's just a couple of hours walk out, and we should be back down by late morning. All expedition equipment, food, and transport is again included, and there's still the opportunity to climb one of the nearby summits to watch the sunset, once we've pitched the tents. These are run any time in summer when it's still light until after 10 in the evening - get in touch to check availability. 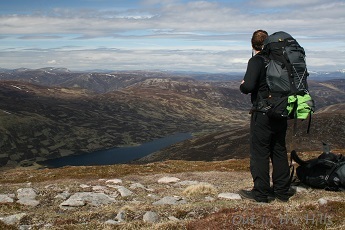 Taster session - short overnight Cairngorm wilderness trek: 1 person £180, each additional person £120.